Our ground cover fabric is available in various widths and lengths and feature row markings for easy plant spacing. The heavy-duty woven material is UV, puncture and tear resistant. Ground covers are extremely flexible in application and can be used in a wide variety of landscape situations. The popular and common ground covers are used for insect protection, frost prevention, weed control, temperature control, sunlight and moisture controls. Ground covers can also be used for aesthetic appearances, so whatever you need ground covering for, your choices will vary. Note: the ground covers offered blow are not ideal for all of the applications listed below. If you plan to extend your growing season into the fall months in order to start growth earlier in the spring, your crops must be protected from possible frost. These blankets are placed directly over plants and shrubs that create a layer for trapping in heat from the ground while keeping frost out. In order to accomplish this, all sides of the frost blanket must be sealed off. See our frost blanket section for a full selection of frost blankets and additional information. Row covers increase the temperature of the area underneath it, keeping the plants underneath safe from freezing. Row covers can either be directly placed over crops or placed over hoops, creating a mini hoop housing. Weeds and insects are one of the biggest plights against crops and plants. It's very important what you do to prevent your plants and crops from coming in contact with either one of these issues. Insects carry diseases that can kill your crops before ever making it to the market. Weeds deprive your plants from much needed nutrients which will prevent them from reaching maturity. There are a number of ground covers that are specifically manufactured for keeping these harmful elements out. These ground covers suppress weed growth while still bringing in water, nutrients and air for the plants. The covers are placed over plants, protecting them through their entire growth, saving on labor and time costs. Our Standard Ground Cover is made from material rated at 3 oz, per square yard, that is durable and UV resistant. We strongly suggest securing the ground cover with our Fabric Stakes or Fabric Securing Staples. Like other ground covers, weed control fabrics keep weeds out while giving plants the essentials that are needed for growth. Unlike other ground covers, these fabrics can be used under rock, organic materials and bark to separate materials from the soil and allow for excellent drainage while keeping weeds out. 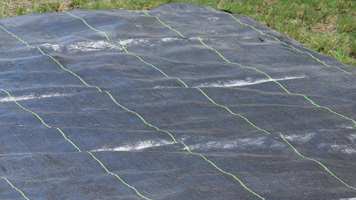 This cover is perfect for creating a weed barrier, it's excellent for landscaping both long-term or short-term. This materials has also been successfully used under paver stones to prevent weeds. Our Standard Ground Cover can be placed under mulch or other materials, suppressing weed growth while offering a great balance of water, air and nutrient transfers. This material is marked in increments of 12-inches for easy measurement and cutting for an exact fit. There are so many different ground covers and options to choose from and can become overwhelming. 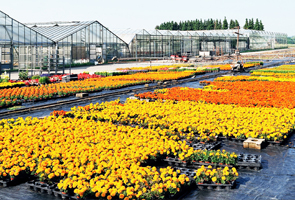 We are available to help you choose the perfect ground cover for your projects, both commercially and residentially.